Having previously only tried two body serums from EO products, I only scratched the surface as to what this brand has to offer. They have everything from haircare to body products to face products. Today's post will focus on two face products I've been incorporating into my daily routine - the Coconut Cleansing Milk and Organic Argan Face Oil. Both have replenished my skin, leaving it hydrated and radiant when I needed it most! Coconut Cleansing Milk | Over the last few weeks I've needed gentle, yet thorough cleansing since my skin was more dry than usual. I didn't want to use anything that would be too harsh or strip my skin of its natural oils. 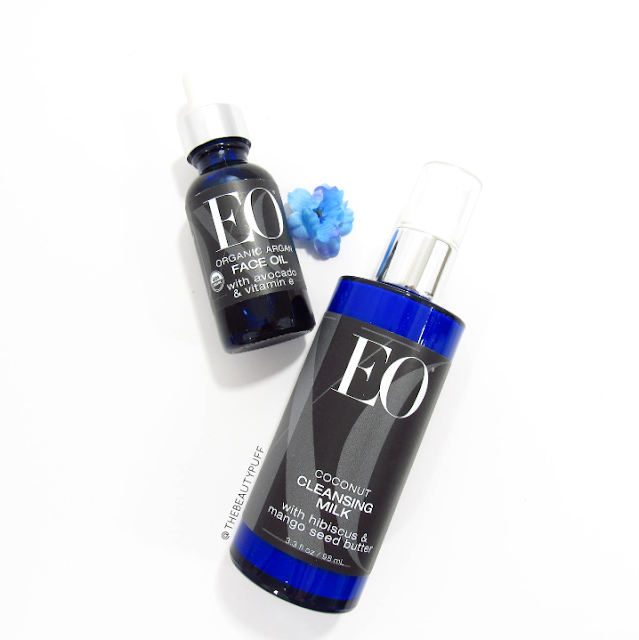 The EO Cleansing Milk provided just the right balance to cleanse, hydrate and replenish my skin. After using this cleansing milk, you're left with smooth, revitalized skin without a trace of makeup. While it is extremely effective at the end of the day, it is also gentle enough to use in the morning. It gave my skin a radiant glow, a great way to start the day! Organic Argan Face Oil | Most often when I talk about oils, I am incorporating them into my nighttime skincare routine. However, this oil has been a lifesaver both morning and night. As I said before, I had an unusual amount of dryness on my face over the last few weeks and I really needed something to quench my skin, without looking greasy. This oil absorbed quickly into my skin and alleviated the dry patches I had been seeing after my makeup was applied. This serum also has organic geranium, grapefruit, lavender, rosemary and vetiver essential oils for a calming scent. I found this oil to be really soothing at night but also appreciated that I could use it in the mornings as well to give my skin an extra boost of hydration. Looking for some new green beauty products to add to your beauty routine? You can find EO Products on Target.com and their website below!